Hi! I'm an Elvis fan from South Africa and thrilled to have come across an Elvis-related blog. Fantastic! Hi, and thank you for visiting my blog! It's really great to hear from fans from other parts of the world. 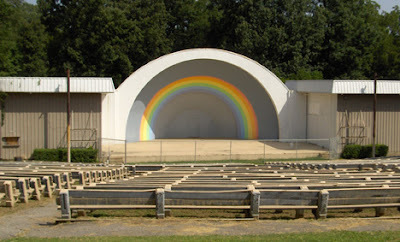 The way I understand it the rainbow was there when Elvis performed back in 1954, so it's too bad about the gold paint. I hope you keep reading Elvis Today. Welcome back!